We lived just outside Wheelus Airforce base in the 50's. 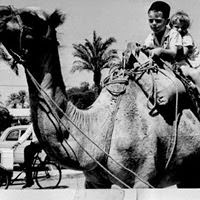 That's me on the back of the camel holding onto my big brother, Russell, for dear life. An expanded form of this story was published in the South Bay Reader in Torrance, California almost twenty years ago, when it won an Honorable Mention in a teeny, weeny writing contest. We lived in Tripoli when I was five years old, just outside Wheelus Air Force Base in Libya. We weren't military, we weren't even American but my father, formerly with British Intelligence had been hired to infiltrate the PX as a manager and investigate the cause of the store's outstanding financial losses. My dad turned out to be a great manager, in fact he was responsible for bringing the hoola hoop to North Africa, holding a big promotional party with hoola hoop demonstrations, clowns, balloons and lemonade in the parking lot. And he found the embezzler too, a good friend of his, he was sorry to say. Back then, (circa 1958) the base boasted one of the largest airplane hangars in the world and we went to a giant Halloween party in it. I went as Minnie Mouse; my tin foil tail trailing behind me and eventually tearing free. The older boys next door dressed up as women with huge breasts fashioned from pillows and great red lips. I think my brother was jealous because he had played it safe and just done himself up as a hobo. He was a fine tramp though with his burnt corked face and sweet blue eyes gleaming. 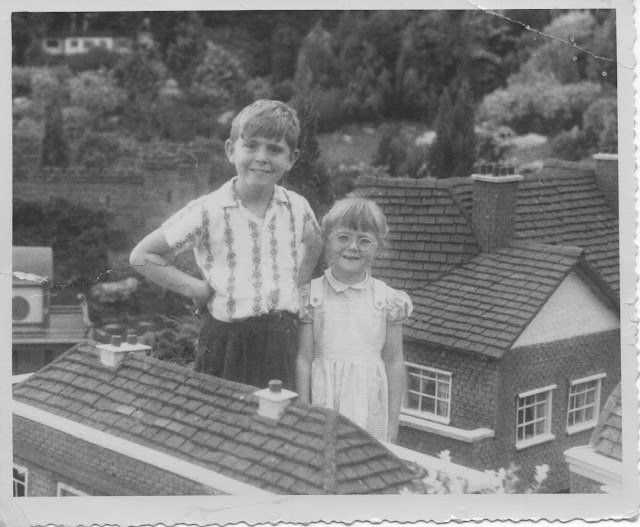 All the houses had flat topped roofs and my parents used to throw parties on ours, chinese lanterns blowing in the night breeze. My sister took her first steps on that roof, running from our mothers' washing basket to me, as the clothes whipped back and forth on the line in the strong desert sun. My favorite place was The Mirage, a restaurant night club combo straight out of Casablanca, all but deserted on blazing summer afternoons when I'd brave the outdoor wooden stage entertaining my mother and the empty blue and yellow painted tables and chairs. Afterwards we'd cool off in the dark of the air-conditioned bar sipping on sweet, syrupy Cokes. What I loved best were the family dinners we ate there. The Mirage was famous with us kids for their mashed potatoes which they served up in scoops of perfect roundness, with a pool of gravy dolloped in the middle. I'd traverse complex waterways through them with my fork before finally savoring their sticky smoothness and the lukewarm gravy. My parents held my fifth birthday party there. Browsing through the old shoebox of faded black and white snap shots, it's easy to pick me, the lone English child, out of the two long rows of perfect little American girls from the base, smiles bright, perfect strands of polished pearls facing each other across the long banquet table. I was the one that was freckled and bespectacled, grin gurgling up a little too giddily. Eyes big with expectation as much as from the thick round magnification lenses slipping down a mouse-sized nose. Miss Mouse, my mother would come in time to call me. After the cake we danced around the May Pole she'd decorated the patio with, pastel streamers cascading gaily down, sweet and musical. Could any fairy princess live in a kinder kingdom? On breezeless summer nights my dad might take us to the beach to see a movie projected on the huge outdoor screen, the waves competing grandly with the film's soundtrack. Leaning pillows up against cement benches sunk into the sand, we'd burrow our feet into its' cooling softness, watch the show and the stars and sometimes drift off to sleep before the film's happy ending. Our house was on a wide and dusty road, the sun bouncing back and forth between the street's powdered haze of sand, the brilliant whiteness of the buildings and the glaring brightness of the sky. This was our neighborhood and unless we were with the boy Mohammed, who wasn't a boy at all but a full grown man, we were forbidden to venture beyond the confines of its narrow square. One day I rode with Mohammed on the back of his bike into the village, my brother peddling alongside. In a shop, musky and shadow-filled, Russell and I sipped on Black Cat colas while Mohammed, drinking a chai; a tiny cup of tea as black and sweet and syrupy as the club's coca colas, spoke to other men in the gruff and secret language only they and my father seemed to understand. On the ride home, my ankle got caught in the bicycle spokes and I screamed until at last poor Mohammed pried it loose and after that I wasn't allowed to go anywhere at all, with or without Mohammed, who I liked and didn't blame a bit. Mostly I didn't mind staying close to home, preferring the company of my eternally singing mother. What other mother could croon "Que Sera, Sera" just as sweet as Doris Day or "Josephina please don leana on da bell, when you mush, please don pusha da bell" with as much verve as Eddie Cantor? There were times though when I got restless and bored and I'd slip off to Debbie's. She lived in the road behind us, her veranda cool and dusky in the shade of an ancient palm. This veranda was our fortress, its thick walls covered with lush Persian rugs. Like the knights my brother was always drawing from his boy's books about King Arthur and Robin Hood, we balanced those castle walls and jousted with broomsticks, apron-capes flying from thin girlish shoulders. "On guard!" I would cry in Russell's voice, "Right makes might". For Debbie, who was six and more experienced—so she said—this excitement paled with time and one day she wanted to go hunting for adventure further afield. Shamed into following, I wandered slowly behind her towards the forbidden village and its beckoning blue mosque. Nearing the town wall, we saw a group of Arab children playing outside the gate; kicking an old ball around, sending the sand swarming with every step. In some unformed notion of panic we turned and almost ran headlong into two young village boys. Faces greyed with grime and sweat, the four of us stood, transfixed, staring. I had never been so close to an Arab boy before, certainly not the kind that probably followed you, running after your car, banging its hood, holding palms out for money. They were both older, at least eight or nine and one was taller than the other and thinner underneath his gallabayo. I wondered why these boys and men wore what looked like the striped nightshirts my brother had not so long ago refused to wear anymore. Now that he was almost eight and practically American, he wanted pyjamas with cowboy stuff on them like the boys next door wore to movie nights at the beach, the kind with the red wagon trains on them like they sold down at the PX. The smaller one started talking in the secret language to the taller one. Jutting his chin at me, he kept muttering in a shrill little voice. Like those tiny yelping dogs with the sharp biting barks he kept on and on. The taller one held my terrified eyes in his. Brown and luminous they were speckled with gold in the midday sun. I didn't know what the smaller boy was saying to the taller boy but I knew it was me he was saying it about. "It's your glasses. Better hand 'em over" Debbie had figured out what all the gesturing was about and, as far as she was concerned, what to do about it. I wasn't so sure. My glasses, my hated British National Health glasses with the round lenses thick as Black Cat cola bottle bottoms, the elasticized metal rims that wound too tightly around my ears, pressing into my skin, itching in the heat. The glasses that stopped my left eye from straying too far afield as though I was looking for my imaginary friend Nancy. The glasses that stopped the world from moving too fast for me to see it. The glasses that took two weird and wobbly faces and made them into one. A moment of silence passed, breath noisy in our throats and then the gibbering began again. the smaller one from snatching the glasses from my face. Too scared to do anything but wail in terror, I watched as the boys ran off, their two shrinking silhouettes becoming four as they wavered and then disappeared mirage-like behind the village gates shimmering in the suns. That evening, I went with my father, his friend Bashir, and the boy, Mohammed, on a search party behind those village walls. Hunting for the culprits we went from house to house, with me staying partly hidden so as not to see too far beyond those curtained doorways and dusky rooms where gruff voices shouted and young brown-eyed boys strained to see me in the fading half-light. "No Daddy, that's not him. No Daddy. No" I barely whispered, squinting to stop the shadows dancing in the dark until these three men would finally give up and we could go home. "Not to worry" my father said, tucking me in at bedtime, his ghost bobbing by his side. "We'll get you a new pair from the PX right away". "With baby blue frames" my mother said kissing my forehead with four ruby'd lips. "Close your eyes now and sweet dreams"
But sweet dreams of baby blue frames were not in sight and I fell asleep, eyes squeezed shut tight, terrified that in the night when I forgot to concentrate, my lids would slip slowly open and my eyeball, slimy, milky, throbbing, its bulging pupil darting here and there, would slither out and fall into the blackness, leaving me screaming, blinded forever, crying in the dark. If you want to read more — thanks so much — I've been posting a growing collection of memoir and a short story or two. Check out On the Street Where I Live Stories for the run down. OH my. This story is haunting. Was it his real eye? Is that possible? It seems unlikely that a poor village boy would have had a glass eye back in the fifties but possible. He may have had a rare condition called global luxation where the eye seems to pop out of the socket. My childish imagination would have done the rest!